"Death Warrant" Stabber Targets Homeless in Santa Monica - Yo! Venice! Update: The LATimes piece placed two of the three stabbings in Santa Monica, but only one was. Police arrested Courtney Anthony Robinson on Friday in Hollywood. Los Angeles and Santa Monica police are investigating at least three stabbings of homeless people as they slept and where typed and signed “death warrants” were left at the scene, according to several law enforcement sources. 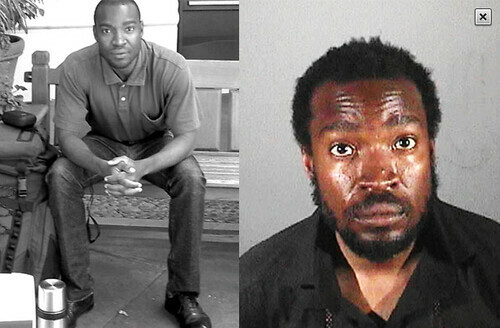 LAPD are looking for Courtney Anthony Robinson, pictured above. The first incident was reported July 4 when a 56-year-old homeless man was found bleeding with a large “hunting-type” knife protruding from his back near the intersection of 3rd and Main streets in Santa Monica, according to the sources. The man crawled 100 yards looking for help while the weapon was lodged between his shoulder blades. On Thursday, a 54-year-old homeless woman was stabbed in the back as she slept near the intersection of La Brea and De Longpre avenues, blocks away from Hollywood High School. Police recovered a black kitchen knife and another “warrant,” also signed by the suspect.